Every company wants to take advantage of festive season. 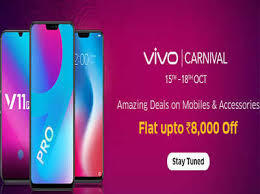 Vivo India has announced its Viva Carnival cell which is being organized on the company's website. Vivo's cell has started and it will run till October 15. The company has given details of the offers and discounts available with many brands of the brand on their website. Customers are getting an option of non-interest EMI. Apart from this, additional discounts are being given to HDFC Bank customers. Selected smartphones are coming with One Time Screen Replacement Offer. Vivo V9 Pro, Vivo V11 Pro, Vivo V9 Youth, Vivo Y66, Vivo Y83 and Vivo X21 are being sold cheaply. In addition, the Vivo brand accessories are also available with a discount. Vivo is selling its Vivo V9 Pro smartphone for Rs 17,990, its price is 19,990 rupees. With this, cashback of Rs 8,995, and an option of non-interest EMI will be available. Rs 4,050 will be benefited by Geo and with HDFC Credit Card, 5% cashback will be given on EMI transaction. Viva V11 Pro's 6 GB RAM variants are being sold for Rs 25,990. With this, the company is offering free Bluetooth earphones, screen replacement warranty, Vodafone customers up to 250 GB data, Geo user advantage of 4,050, EMI without interest and 5% cashback with HDFC Bank credit card. Vivo V11 6 GB RAM variants are listed for Rs 20,990. Its offer is only with Vivo V11 Pro. Vivo V9 is listed at Rs 15,990, while it is available in the market at Rs 18,990. This phone comes with HDFC Bank cashback and Jio offers. Customers will be able to buy this phone in the option of non-interest EMI. Similarly Vivo V9 Youth is being sold for Rs 13,990. Interested customers can buy Vivo Y66 for Rs 7,990. Under Vivo Carnival, Vivo Y83 is being sold for Rs 13,990. Vivo X21 will be sold for Rs 31,990.